I know, this post is a teeny tiny bit belated. But see that balloon in the above photo? I brought it home with me on New Year’s and it’s still floating! (I even have photo evidence, taken this very evening – see below!) And since we all know that helium balloons never last, it can’t be too long after New Year’s, can it? 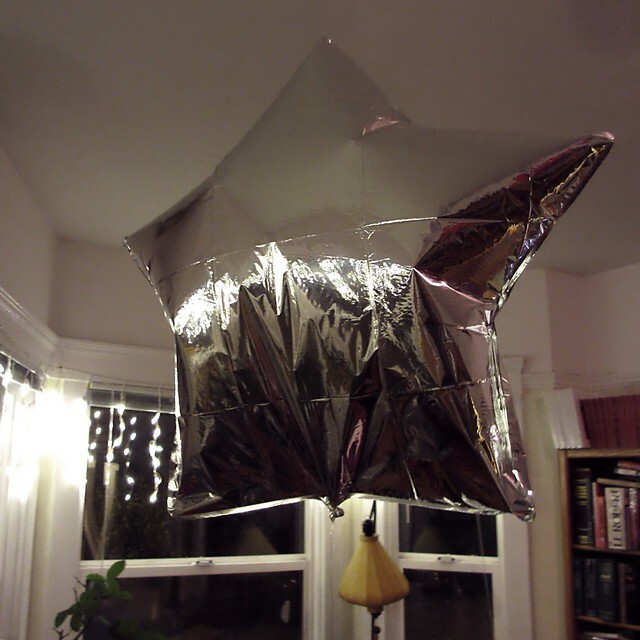 New Year’s Balloon – still kickin’ over 3 weeks later! Even though it’s a bit late in the telling, I feel like I got the year kicked off on the right foot. 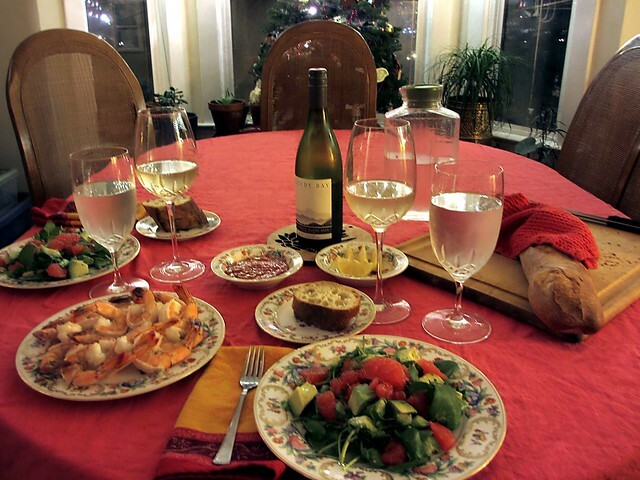 For New Year’s Eve dinner, my husband and I made a lovely dinner consisting of shrimp cocktail, homemade bread (made by my husband – he’s an excellent baker! ), and an avocado, grapefruit, and watercress salad. Plus a bottle of Cloudy Bay Sauvignon Blanc – a favorite introduced by our friend Rich. 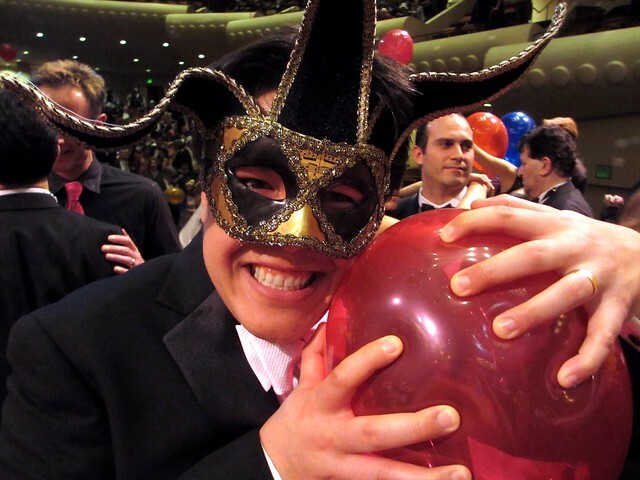 And then we headed off to Davies Symphony Hall for the New Year’s Masquerade Ball. 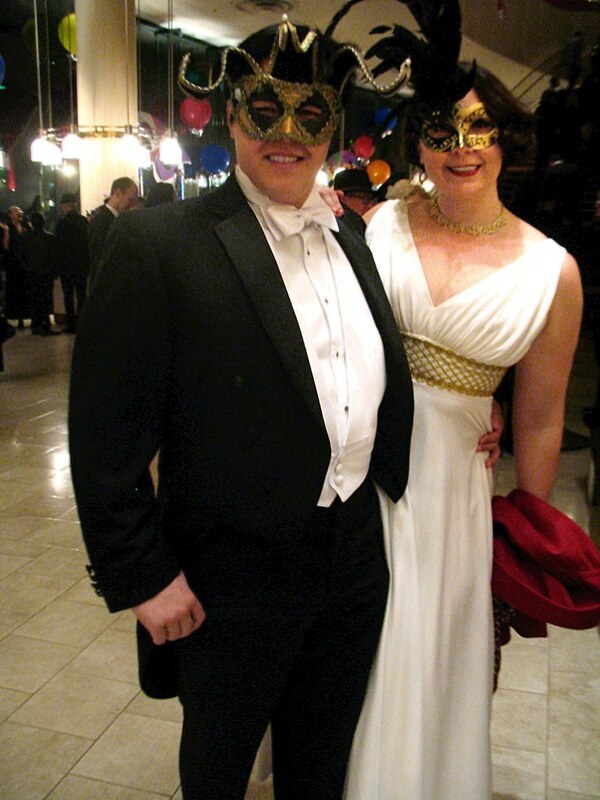 We went last year and had such a fabulous time that we decided it should be a tradition. 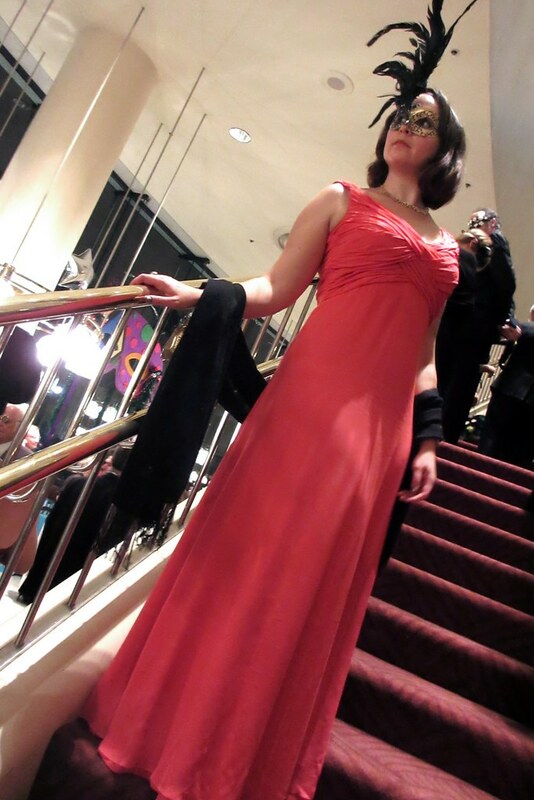 I donned a coral Armani Collezioni silk chiffon gown that I found several months ago at Nordstrom Rack and hadn’t yet worn. It’s one of those things that you’ll never find if you’re looking for it . . . I just happened across it one day, tried it on a whim, and found that it fit beautifully and felt lovely. And, at over 90% off, it was totally affordable! 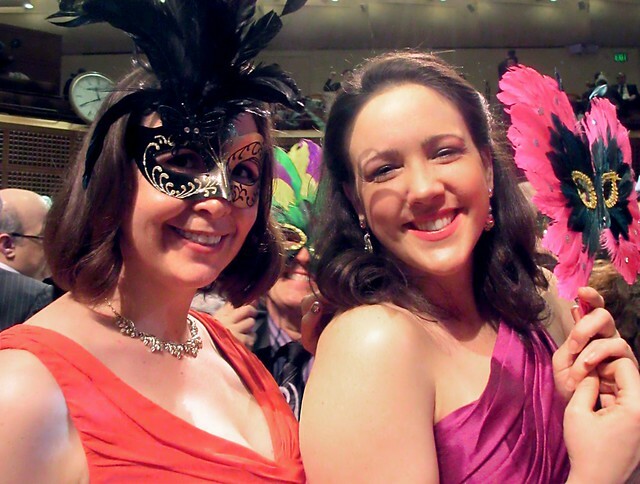 We had a wonderful time listening to the symphony, eyeing the gorgeous gowns (okay, maybe I was the one really eyeing the gowns), and enjoying the high spirits of the crowd. 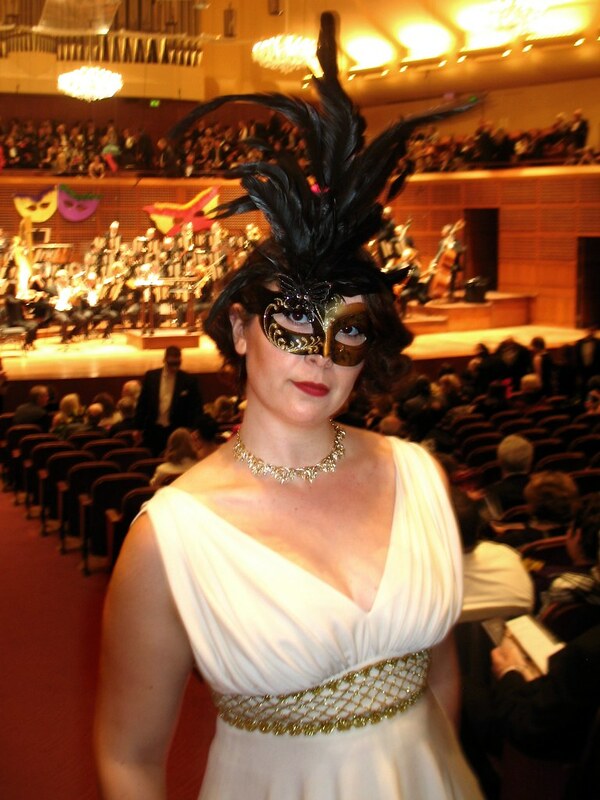 Before 2012 ended, we danced to the tunes of the Peter Mintun Orchestra . . .
. . . and I had the honor of meeting the enchanting Susanna Phillips, the Symphony’s soloist that evening. 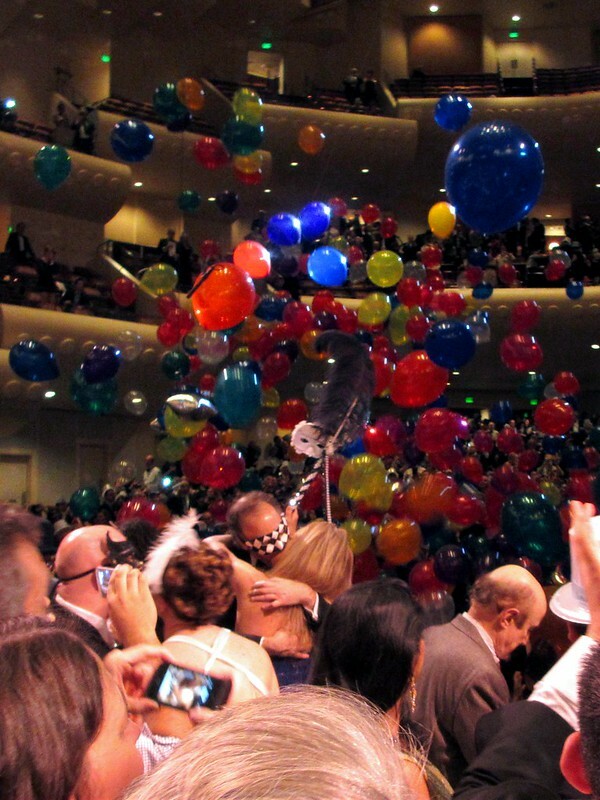 Soon enough it was midnight – heralded by a balloon drop . . .
. . . and celebrated by balloon clutching! Happy New Year! I hope y’all have had a fabulous 2013 so far!! New Year’s Eve is supposed to be a perfect, magical night – a night that sets the stage for the rest of year. Of course, with expectations like that, it’s not surprising that people get stressed out planning for it, and the night itself can be something of a letdown. Last year I was super excited for New Year’s Eve. 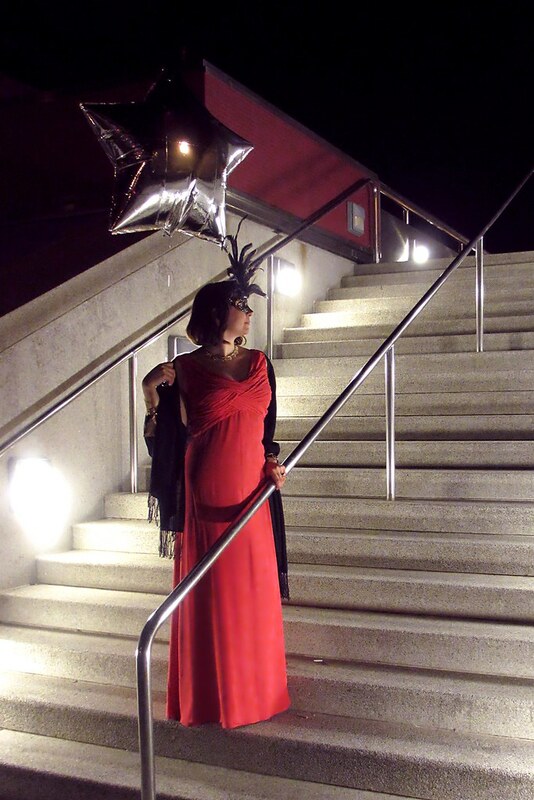 My husband’s parents gave us tickets to the San Francisco Symphony Masquerade Ball, and I had plans to wear a fabulous vintage deco-era fuchsia gown. Pat, my husband, and I would go to the East coast to visit my family for Christmas, but we’d be back in San Francisco a few days before New Year’s. Plenty of time to get ready! Right? And yet… not. Due to horrible winter weather, our return flight was cancelled and we were stuck in D.C. for three days – rebooked onto an early morning New Year’s Day flight. So heartbreaking! 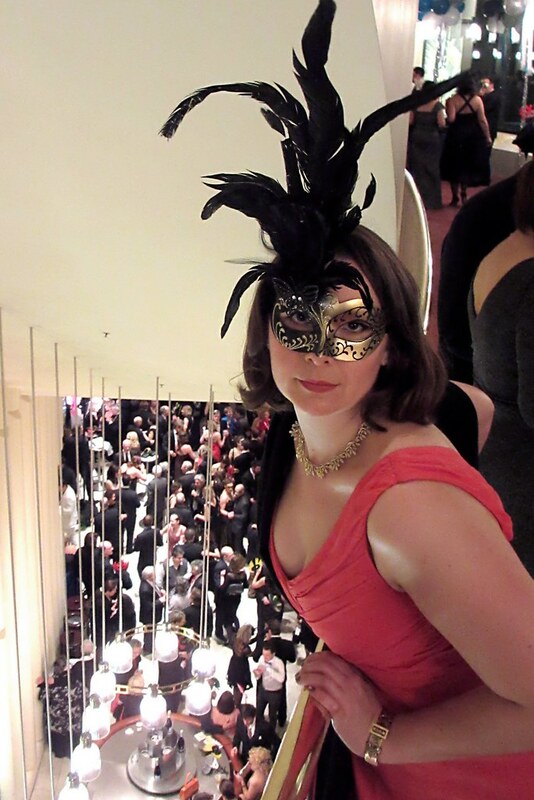 I had never gone to a ball before – and everything turned to rags before I even got to go. Alright, back to this year. 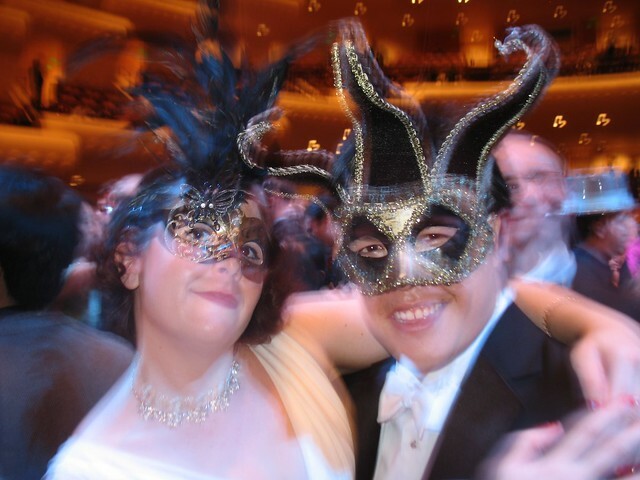 As planned, we used our Symphony gift certificates to buy tickets to the New Year’s Eve ball. And since we weren’t traveling this year (after previous transportation debacles, we figured we could use at least one year off! ), we had plenty of time to prep. I helped Pat choose a tux (he decided it was time to own one), and we ended up finding a fantastic deal at Jos. A Bank. For Christmas, I bought Pat a vintage Krementz cufflink and tuxedo shirt stud set. And I decided to wear my wedding dress – a vintage 1970s ivory gown that’s perfect for dancing. 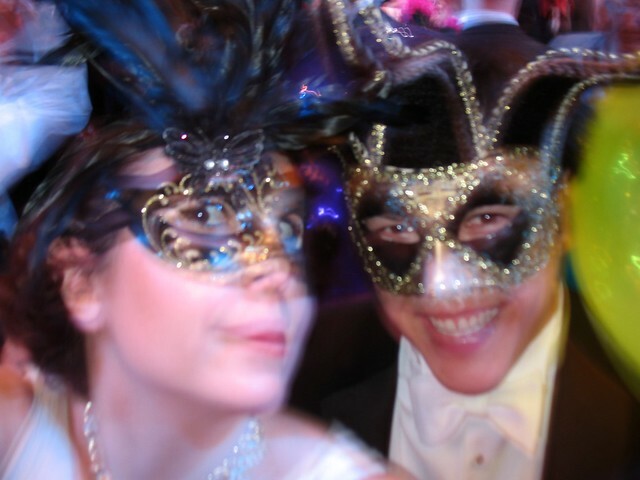 Of course, because it was a masquerade ball, we picked up a couple of Venetian masks to go with our ensembles. The evening had a lovely start, with cocktails and live music in the lobby. Cocktail hour was followed by the concert, conducted by Michael Francis. 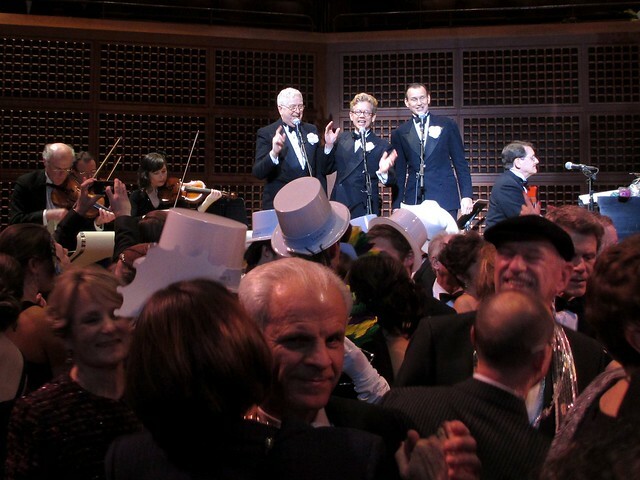 Most of the pieces were waltzes – a perfect way to set the mood for dancing later. 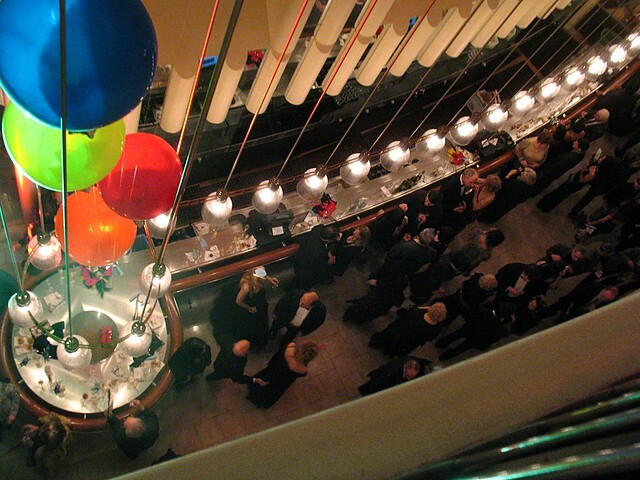 After the concert, we enjoyed free prosecco (supplied by La Marca) and desserts in the lobby. 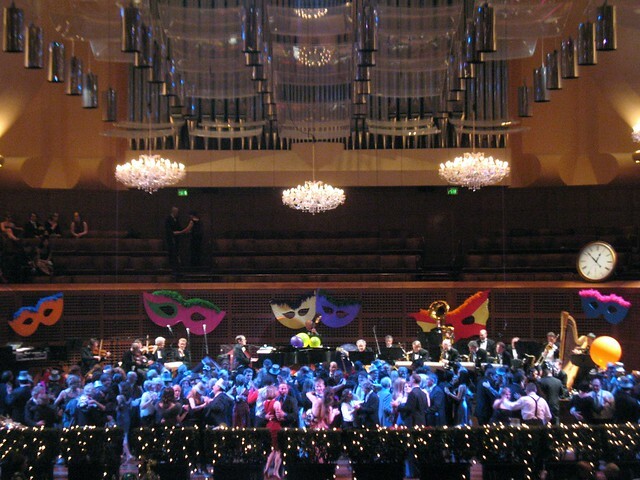 And then the most wonderful part – dancing on the concert hall stage to live music played by the Peter Mintun Orchestra. 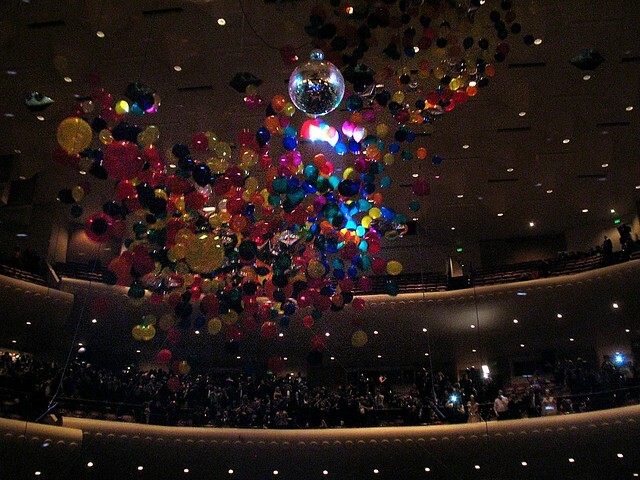 There was a balloon drop at midnight, followed by more dancing and revelry. 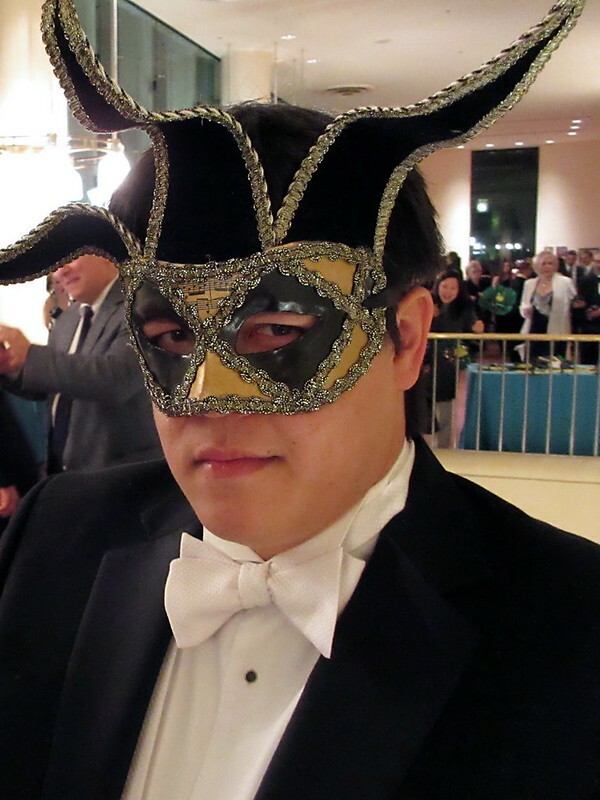 It was, indeed, a magical night – well worth the wait! Wishing you health, wealth, and happiness in the new year!